The doubly unsaturated linoleic acid (14.2-17%). Having a high content of di- and triunsaturated esters, linseed oil is particularly susceptible to polymerization reactions upon exposure to oxygen in air. This polymerization, which is called drying, results in the rigidification of the material. The drying process can be so exothermic as to pose a fire hazard under certain circumstances. To prevent premature drying, linseed oil-based products (oil paints, putty) should be stored in air-tight containers. Like some other drying oils, linseed oil exhibits fluorescence under UV light after degradation. Most applications of linseed oil exploit its drying properties, i.e., the initial material is liquid or at least pliable and the aged material is rigid but not brittle. The water-repelling (hydrophobic) nature of the resulting hydrocarbon-based material is advantageous. "Your country needs flax .." U.S. WWII poster soliciting linseed oil for use in paint. Linseed oil is a common carrier used in oil paint. It can also be used as a painting medium, making oil paints more fluid, transparent and glossy. It is available in varieties such as cold pressed, alkali refined, sun bleached, sun thickened, and polymerised (stand oil). The introduction of linseed oil was a significant advance in the technology of oil painting. Traditional glazing putty, consisting of a paste of chalk powder and linseed oil, is a sealant for glass windows that hardens within a few weeks of application and can then be painted over. The utility of putty is owed to the drying properties of linseed oil. When used as a wood finish, linseed oil dries slowly and shrinks little upon hardening. Linseed oil does not cover the surface as varnish does, but soaks into the (visible and microscopic) pores, leaving a shiny but not glossy surface that shows off the grain of the wood. A linseed oil finish is easily repaired, but it provides no significant barrier against scratching. Only wax finishes are less protective. Liquid water penetrates a linseed oil finish in mere minutes, and water vapour bypasses it almost completely. Garden furniture treated with linseed oil may develop mildew. Oiled wood may be yellowish and is likely to darken with age. Because it fills the pores, linseed oil partially protects wood from denting by compression. Linseed oil is a traditional finish for gun stocks, though very fine finish may require months to obtain. Several coats of linseed oil is the traditional protective coating for the raw willow wood of cricket bats; it is used so that the wood retains some moisture. New cricket bats are coated with linseed oil and knocked-in to perfection so they last longer. Linseed oil is also often used by billiards or pool cue-makers for cue shafts, as a lubricant/protectant for wooden recorders, and used in place of epoxy to seal modern wooden surfboards. Additionally, a luthier may use linseed oil when reconditioning a guitar, mandolin, or other stringed instrument's fret board; lemon-scented mineral oil is commonly used for cleaning, then a light amount of linseed oil (or other drying oil) is applied to protect it from grime that might otherwise result in accelerated deterioration of the wood. Boiled linseed oil is used as sizing in traditional oil gilding to adhere sheets of gold leaf to a substrate (parchment, canvas, Armenian bole, etc.) It has a much longer working time than water-based size and gives a firm smooth surface which is adhesive enough in the first 12–24 hours after application to cause the gold to attach firmly to the intended surface. Linseed oil is used to bind wood dust, cork particles, and related materials in the manufacture of the floor covering linoleum. After its invention in 1860 by Frederick Walton, linoleum, or 'lino' for short, was a common form of domestic and industrial floor covering from the 1870s until the 1970s when it was largely replaced by PVC ('vinyl') floor coverings. However, since the 1990s, linoleum is on the rise again, being considered more environmentally sound than PVC. Linoleum has given its name to the printmaking technique linocut, in which a relief design is cut into the smooth surface and then inked and used to print an image. The results are similar to those obtained by woodcut printing. Flax seed oil is easily oxidized, and rapidly becomes rancid, with an unpleasant odour, unless refrigerated. Even when kept under cool conditions, it has a shelf life of only a few weeks. Oil with an unpleasant or rancid odor should be discarded. Oxidation of flax seed oil is a major commercial concern, and antioxidants may be added to prevent rancidification. Linseed oil is not generally recommended for use in cooking, yet one study does show that the alpha linolenic acid (ALA) while bound in flaxseed was found to be stable for cooking. When bound to flaxseed ALA can withstand temperatures up to 350 degrees F (176.67 C) for two hours. Food-grade flaxseed oil is cold-pressed, obtained without solvent extraction, in the absence of oxygen, and marketed as edible flaxseed oil. Fresh, refrigerated and unprocessed, linseed oil is used as a nutritional supplement and is a traditional European ethnic food, highly regarded for its hearty taste. It contains the highest level of the omega-3 fatty acid ALA among vegetable oils. Regular flaxseed oil contains between 52% and 63% ALA (C18:3 n-3). Plant breeders have developed flaxseed with both higher ALA (70%) and very low ALA content (< 3%). The USFDA granted generally recognized as safe (GRAS) status for high alpha linolenic flaxseed oil. Nutrition information from the Flax Council of Canada. Flax seed oil contains no significant amounts of protein, carbohydrates or fibre. Stand oil is generated by heating linseed oil near 300 °C for a few days in the complete absence of air. 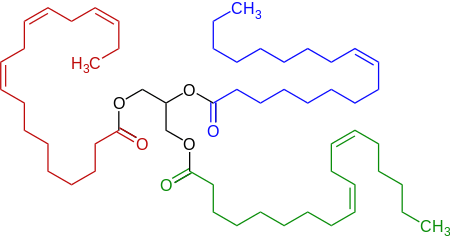 Under these conditions, the polyunsaturated fatty esters convert to conjugated dienes, which then undergo Diels-Alder reactions, leading to crosslinking. The product, which is highly viscous, gives highly uniform coatings that "dry" to more elastic coatings than linseed oil itself. Soybean oil can be treated similarly, but converts more slowly. On the other hand, tung oil converts very quickly, being complete in minutes at 260 °C. Coatings prepared from stand oils are less prone to yellowing than are coatings derived from the parent oils. Today, "boiled linseed oil" refers to a combination of raw linseed oil, stand oil (see above), and metallic dryers (catalysts to accelerate drying). In Medieval times, linseed oil was boiled with lead oxide (litharge) to give a product called boiled linseed oil. The lead oxide forms lead "soaps" (lead oxide is alkaline) which promotes hardening (polymerisation) of linseed oil by reaction with atmospheric oxygen. Heating shortens its drying time. In 1991, One Meridian Plaza, a high rise in Philadelphia, was severely damaged and three firefighters perished in a fire thought to be caused by linseed oil-soaked rags. ↑ A. G. Vereshagin and G. V. Novitskaya (1965) The triglyceride composition of linseed oil. Journal of the American Oil Chemists' Society 42, 970-974. ↑ Flexner, Bob. Understanding Wood Finishing. Reader's Digest Association, Inc, 2005, p. 75. ↑ James Laver, "Preparing Your Cricket Bat - Knocking In," ABC of Cricket. ↑ "Flax Seed Oil". Busy Women's Fitness. Retrieved 2008-01-24. ↑ D. Berab, D. Lahirib & A. Naga (June 2006). "Studies on a natural antioxidant for stabilization of edible oil and comparison with synthetic antioxidants". Journal of Food Engineering. 74 (4): 542–545. doi:10.1016/j.jfoodeng.2005.03.042. ↑ "Oxidative stability of flaxseed lipids during baking". Retrieved 2013-01-29. ↑ Muir, Alister D. (2003). Flax, The genus Linum, p. 298. Taylor & Francis Ltd. ISBN 0-415-30807-0. ↑ "U.S. FDA/CFSAN Agency Response Letter GRAS Notice No. GRN 00256". U.S. FDA/CFSAN. Retrieved 2013-01-29. ↑ "Linseed" (PDF). Interactive European Network for Industrial Crops and their Applications. October 14, 2002. Retrieved 2008-01-24. ↑ "Flax - A Healthy Food". Flax Council of Canada. Retrieved 2008-01-24. ↑ Leah Goldberg (2008-10-26). "Measuring Rate Capability of a Bakelite-Trigger RPC Coated with Linseed Oil". American Physical Society. Bibcode:2008APS..DNP.DA033G. Wikimedia Commons has media related to Linseed oil.